Spela Casino is a relative new-comer having launched in 2018, however their owner Genesis Global is a well-established big name in online casinos. Spela means to play. And that’s exactly what Spela Casino, it’s motto is that ‘fun should be uncomplicated’. So Spela have made it that way, with no registration required you can literally deposit and play. The Welcome Bonus is a quick one – 100 bonus spins. Spela Casino have taken the complicated and made it fun and utterly uncomplicated. Did we mention that they have some of the fastest withdrawal times around? Spela Casino thinks ‘Fun should be uncomplicated’ so their Welcome Bonus is just that, uncomplicated. When you deposit €20 or more you receive 100 bonus spin rewarded at the rate of 20 per day for 5 days. Spins are available to use on the Starburst Slot machine. The wagering requirement on this is 40X and the bonus spins have a validity of 24 hours. Just like that, uncomplicated fun. We understand that this doesn’t really get you pumped up like some of the other big welcome offers you find out there. But what Spela Casino does is make it easy, uncomplicated and with all their other perks and quirks they kind of have a point. Fun should be uncomplicated and online casinos like Spela should be fun. Spela Casino’s VIP Program is advertised as tailored to the individual. Boasting such things as personalised account managers, withdrawal plan, exclusive promotions and bonuses, entry into a monthly VIP prize draw and exclusive VIP holiday packages. What more could you want from a VIP Program. Not only do you get the standard VIP bonuses, such as withdrawal plans and account managers you also have the added bonus of winning holiday packages. It’s a win-win with Spela. This is an area where Spela Casino stand out from the crowd. You don’t have the options available like the rest of the industry. With Spela Casino you choose between 8 or 10 Finnish or Swedish banks you’d like to make your deposit from. After you choose your bank, you’ll have to verify your identity. Once that’s done your payment will go through and you’re ready to play. All payments are processed through Trustly and deposits and withdrawals are both nearly instant. Yep you read that right, because you verify your identity at the start, you don’t have to do it again when the time comes to withdraw. Once you’ve won and as long as you’ve met the bonus wagering requirements (if there were any) you can withdraw and it will hit your account within 24 hours. If that’s not something to write home about I don’t know what is! On top of that there’s no fees for depositing or withdrawing. And the limits are high, you can deposit up to €10,000 a day and withdraw €10,00 every 24 hours, or €25,000 per seven (7) days and €50,000 a month. Spela Casino boast a huge range of games, over 1300. Powered by NetEnt, Play ‘n Go, 2by2 Games, Big Time Gaming, bluberi, ELK Studios, Fantasma Games, Games Warehouse, Geko Gaming, Genesis Gaming, Microgaming, NextGen, Old Skool Studios, Push Gaming, Rabcat, Thunderkick, Gamomat, Kalamba & Oryx. With a list of developers this long it’s no wonder that Spela Casino have something for everyone. Within the 1300 games they have more than 25 Blackjack variants and more than 40 Roulette variants. Themes include animals, wizards, money, movies, fairy tales, fantasy, ninjas, exotic animals or places, magic, Roman times, Egyptian times just to name a few. Slot titles include Starburst, Dead or Alive, Gonzo’s Quest, Game of Thrones, Break da Bank Again. The video poker selection includes Jacks or Better, Joker Poker, Deuces Wild, Jackpot Poker, Joker Wild, All American, Louisiana Double, Bonus Poker Deluxe, Double Joker, All Aces and Poker Power Poker. The lists just go on and on, their range of titles reflects the sheer number of software providers that Spela Casino have on-board with them. You will definitely find something at Spela Casino that suits you. Immersive Roulette, Rapid Roulette, Exclusive Blackjack, Lightning Roulette, Speed Baccarat, Sonya Blackjack, Auto Roulette, Dream Catcher, American Roulette, Live Caribbean Stud Poker, Blackjack, French Roulette Gold, VIP Roulette, Dragon Tiger Live, Baccarat Controlled Squeeze, Dragonara, Shangri La, Texas Hold’em Ultimate, Turkish Roulette and more. We did notice that there were several duplicate games, however this comes in handy when the volume of players increases during the weekends. They have two great features within the live casino games that e found really useful. The first was the ability to move the camera angle to suit you better. And the second was that if the tables are full you can bet behind other players. In terms of betting stakes, we were impressed. You can find games starting at €0.50 and heading all the way up to €5,000. The card games go even higher at some tables sitting at €10,000. Roulette takes it to another level, with their high-roller table sitting at €75,000. Spela Casino do not have an app available with either Android or Apple, remember these guys are all about uncomplicated fun. Their mobile site is like the website, clean, clear and easy to navigate. They’ve got about 100 games that translate well to the mobile site, so not their full range but something to keep you going on the move. Again because there is no need to register you can quickly deposit and withdraw from your mobile device, the welcome bonus is redeemable from here as well. It’s a mini-me of their website and it runs and works exactly the same. Here’s hoping that they can get a broader range of games available on this platform shortly. Spela Casino is licensed and regulated through the Malta Gaming Authority. They make use of a 128-bit SSL encryption, making sure that all your details are safe and secure. 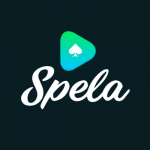 Spela Casino is restricted in the following countries: Australia, Belgium, Denmark, France, Hungary, Iran, Israel, Italy, Portugal, Romania, Slovenia, Spain, Turkey, Ukraine and United States. Spela Casino’s customer support is open from 08:00 – 01:00 GMT. This is across all of the contact channels. They do have an extensive FAQ page though, so make sure you head there and check it out. Alternatively here are the options to contact Spela Casino’s customer service team. live chat: is available at the above times. Spela Casino also have a large social media presence, as you would expect from a new casino in this day and age. They have accounts on Facebook, Instagram, YouTube, Twitter and Google +. You can use these avenues to contact Spela Casino, however obviously for something to do with your account you are best going straight to the FAQ Page, Live Chat, E-mail or phone. With Spela Casino you can set daily, weekly or monthly restrictions, change your limits and set self-exclusions. You can also find links to gambling counselling organisations like GamCare, Gamblers Anonymous and Gambling Therapy. And they also have information on underage gambling and some links to filtering solutions. Spela Casino is a modern twist on the old school online casino, and it’s fast becoming one of the cool kids. The website has a real ‘cool’ vibe with it’s green, blue and black colour scheme it even looks cool. The landing page is really well-laid out and it’s easy to move around. There’s no giant menus here, and it can take a while to find what you are looking for. But they have simplicity going for them, they make it easy for you narrow down the search, they make it easy for you to play, they make it easy for you to deposit and withdraw. They make it easy for you – the customer. They literally do what the box says – fun should be uncomplicated. Nailed it! Spela Casino are doing things a little different than everyone else. No registration, one method for deposits and withdrawals, insanely quick withdrawals, a huge list of software developers. They’re standing out, and in doing so they are creating a name for themselves – quickly. Some of you might not like the no registration, the lack of deposit/withdrawal methods. But you can’t deny that they are in a position to perhaps shake up the entire industry with these new ideas. How long have you waited for a withdrawal to hit your account? A week, ten working days, five working days? Spela Casino say they can get your money to you in 24 hours. And with the large withdrawal and deposit limits, who can really snub their nose at that. It might seem strange not having to log in, just jump on the site and away you go. But really isn’t that what fun is all about. Just jumping in?